This patient came to us wanting to address her sagging eyelids in order to open up her face. We worked together to decide on a blepharoplasty procedure that would cover all of her concerns. Blepharoplasty, or eyelid surgery, is a facial plastic surgery procedure in which excess skin and tissue around the eyelids is removed to create a refreshed, youthful appearance. Blepharoplasty is one of the most common cosmetic surgeries today. It has ranked among the top five most popular procedures in the country for over 15 years. 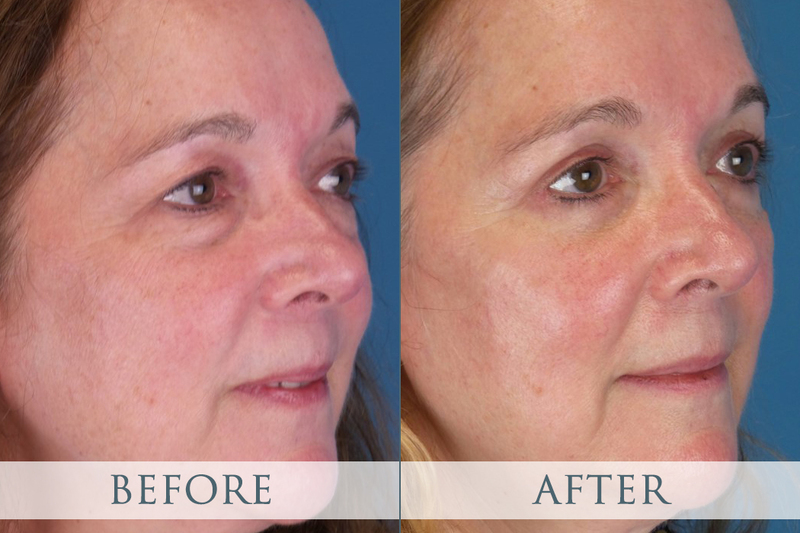 While this patient wanted primarily to address her top lids, blepharoplasty also works to remove excess tissue or bags underneath the eyes or eliminate excess skin or folds that surround the eyes. It’s also common for patients to choose to combine blepharoplasty procedures with brow lifts to achieve more significant results. Commonly known as a “forehead lift,” a brow lift addresses deep lines and creases across the forehead, wrinkles on the bridge of the nose, and droopy or sagging eyebrows. To ensure the best possible results, scars can be hidden in the natural folds of the eyes or along your hairline in the case of a brow lift. We also aim to keep recovery as easy and effective as possible. Typically, following your eyelid surgery, your eyes will need as much rest as possible for the first few weeks. Redness or swelling from surgery will fade in the weeks following the procedure. If you may be interested in eyelid surgery or additional ways to rejuvenate your look, please give us a call today at (404) 257-9888 to learn more and schedule a free consultation!